shopping streets fill the itinerary of the traveler to Berlin. But there are things not worth doing and things that you never should do when you are in Berlin. This cosmopolitan city is full of amazing ​things to see and do, and customs to follow when you are visiting so here are our words of caution and the things you'll not want to be doing when visiting Berlin. The TV Tower at Alexanderplatz is impossible to miss. Even if you don't cross through this all-important square, the tallest structure in Germany can be seen down Allees all over the city. But many feel that the best part of the tower is the view of it, not from it. While admiring the tower from afar is easy, going up in the tower is less so. To start with, you have the trouble of admission. It's not uncommon to have an hour-plus line. If you are determined to go up, you'd best reserve a spot online. Once you have gone through metal detectors and are ascending the tower by elevator, you will be immersed in 1960s GDR decor and crowds of tourists. The viewing platforms are behind insulated glass which allows for semi-panoramic views of the city, but far from the best conditions for a perfect picture. 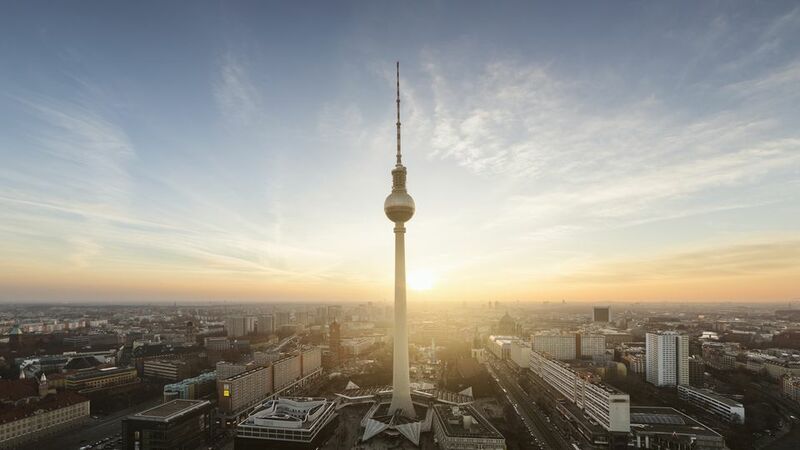 The last downside of going up in Berlin's TV Tower is the price. At over ten euros, it is fairly expensive for a Berlin attraction. Alternative suggestion: Better views of the city (including the beloved disco ball) can be found from several rooftop bars, a hot air balloon, and even the glass-domed Reichstag (government building). Sure, the currywurst is the cheapest thing on the menu but a sit-down restaurant is not the place to order it. Street food is not just convenient with an Imbiss (snack shop) on every corner, it is done best by the people slinging wurst every day. At a restaurant, order something ​ridiculously meaty that requires a knife and fork, sit back and enjoy. Alternative suggestion: Order Berlin Street food from the street. The guide to the best currywurst in Berlin will give you some ideas. Dive into the tasty world of German sausage and sample your way through the city's ample offerings of Döner Kebob, a rotisserie meat. And no matter how inexpensive wurst is at a restaurant, you can do no cheaper than on the street. A Bratwurst from a walking street vendor goes for less than two euros. The best-known Berlin Wall crossing between East and West still exists today...in a form. Once the point where everyone from diplomats to tourists had to pass to get into Berlin’s Soviet sector, the area is now consistently swarmed with tourists. After fighting through the crowd, visitors find the scene re-staged, but little is authentic. The original guard booth has been moved to a museum, actors playing soldiers are available for peace-signing photo ops and the Checkpoint Charlie Museum is more about flashy displays than history. Alternative suggestion: Visit the Allied Museum. This museum, located in the southwest of the city (near the American embassy), is detailed, free, and contains the original guardhouse from Checkpoint Charlie. For a city this big, you need to invest in transport. Some people choose to do that with a bus tour. But the mechanical, recorded voice accompanied by tourists groups blindly clicking away, is not the way to go. Alternative suggestion: The city's public transport system can help you easily move about the city. There are UBahns (subway), S-Bahn and regional trains, trams, boats, and a bus system. More than just a way to get around, buses 100 and 200 take you by some of the best sights in the city, all for the low, low cost of a bus ticket. Hop on a double-decker bus at Alexanderplatz and cruise by the dramatic Berliner Dom on Musueminsel. Circle the Siegessäule on your way to West Berlin’s Zoological Garten. And enjoy riding with the locals. Many visitors go to Kaufhaus de Westins (KaDeWe), a symbol of the opulence of West Berlin that draws the curious and the status-conscious. T-shirts for €300? They have them. You'll also find a floor full of the international foods typical of gourmet stores back home. And you'll be able to grab a bite at a cafeteria that features delicacies that wouldn't look out of place in a fine-dining restaurant. But this mall is no longer the most exciting place to shop in Berlin. The city's hip, eclectic, young vibe has allowed for loads of new shops to open in former East and West. Alternative suggestion: The city's array of new shops and its many markets are fascinating places to shop. Pick up brass door handles and chandeliers at Berliner Trödelmarkt, fight the crowds for cheap jewelry at Mauerpark, or find fresh produce and fabrics at the Turkish Market on Maybachufer. Your experience will be richer and more typical of diverse Berlin if you explore these shops. Just a muddy lot during the time of the Berlin Wall, Potsdamer Platz has grown into a half-failed business center à la Times Square. Neon lights, a movie megaplex, wild architecture, and, yes, pieces of the wall. They were dragged there for the tourists so you will always see groups making peace signs and taking pictures in front of these concrete slabs of history. However, this is not the place to partake of authentic Berlin Wall history. Right after the fall of the wall, there was a push to remove this symbol of division. The wall was ripped down by individuals before a realization that samples of the wall should be kept for posterity. A few large sections are preserved, with little bits showing up around the city. You really can't appreciate the scale and history of the wall with these stand-alone pieces. Alternative suggestions: Two sites offer a far better idea of the reality of the wall than these scattered pieces. The Bernauer Strasse Wall Memorial is an expansive open-air museum that shows a full-scale replica of the guard towers, two wall segments, and the various defenses employed with the wall, as well as an excellent walking tour and museum. The East Side Gallery has the longest remaining section of the wall which was reinvented shortly after reunification to be a gallery for peace. And another "not to do" here. While you may see people scrawling their name on East Side Gallery or even chipping off pieces, this behavior is not acceptable. People scour the streets around Gertrud-Kolmar-Strasse, guidebook in hand, looking for signs of the infamous Führer. His death in a bunker beneath the city is only marked by an information board in an attempt to prevent it from becoming a pilgrimage point for neo-nazis. It is almost always a disappointment, perhaps rightfully so. Alternative suggestions: Spend less time thinking about Hitler and more time considering his 6 million victims. The nearby Memorial to the Murdered Jews of Europe is the best place to start, with the Memorial to Homosexuals Persecuted Under Nazism and Memorial to the Sinti and Roma of Europe within walking distance. After getting to know the city, I was dismayed to read guidebooks that centered completely on Mitte (central neighborhood) with a few forays into the former West. Berlin is a huge city and each Kiez (neighborhood) has a personality all of its own. Alternative suggestions: Try neighborhoods like Friedrichshain, Kreuzberg and Prenzlauer Berg for a totally different feel. Berlin is enormous and amazing. It is astounding how many people you talk to who came for a weekend and had to extend their trip. There is simply too much to explore, too many experiences to have. While there isn't a wrong amount of time you can visit the city, know the longer you stay the deeper you can dive into all that Berlin offers. Berliners are very rule-conscious. Learn the traffic rules and follow them. For example, crossing the street when the when the little man is red is verboten. Cyclists are advised to pay attention to red lights too. Pedestrians are cautioned to avoid walking in bike lanes. Cyclists will not slow down for you and are fairly aggressive. Stick to the sidewalks and don't jaywalk. You'll hear about it from the rule-conscious locals.